New levelling systems hope to reduce the burn of RNG. In addition to adding new maps, plenty of new enemies and talents for each class, Fatshark's follow-up to the excellent Warhammer: End Times—Vermintide is making significant changes to the first game's progression systems. Vermintide's loot sets the game apart from Left 4 Dead, and gives players strong incentives to keep coming back to try out new toys. Just after we finished playing a round of Vermintide last week, UK editor in chief Samuel Roberts messaged us with pictures of the mad exploding staff he had just unlocked, and I found a sword and shield that encourages me to swap out my warhammer and adopt a different style in our next session. Fatshark has identified problems with Vermintide 1, however. I sat down for a long chat with them towards the end of last year for a cover feature, which is now online. 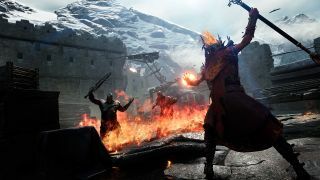 Game designer and producer Victor Magnuson, and game director Anders De Geer, had a lot to say about the changes the team are making to the sequel. Today I have focused on loot, but we'll cover new enemies and locations in the coming weeks. "A lot of people felt it was too harsh or hard to get good loot," says Victor of the first game. "We also did a lot of stuff for it in Vermintide already, so we already tried to address it as much as we could, but there was elements of it that we really couldn't fix because they were inherent to how the system was built from the start. We could make it easier for you to get the weapons you wanted but we couldn't give you more stuff, because we would have run out of items too fast and the game would break." We had levels in Vermintide, but they didn't actually do anything. You got a new weapon each time you levelled up, but in the end it was just a number that told you how much you'd played. Anders points out that "almost 100% of the characters' power if you disregard player skill, came from the loot system. The loot system was RNG based mostly, except for the forge and the shrine. That made it hard for us to control how long it would take you to reach a certain power." There are trait differences in top-tier weapons in the first Vermintide, but Fatshark's designers reckon that it was a "shallow system" compared to what they have been working on since. "We've revamped for this game," says Magnuson. "We've completely revamped how we do items, so we now use a power level system. Even if you have an orange weapon, if you play a harder difficulty and get a blue weapon it might be interesting for you again. The power increase doesn't come from the rarity anymore, the rarity only dictates the properties on the weapon. The power level is where you actually get the increase in power." The power of your character will come, in part, from their level. Magnuson says that "we had levels in Vermintide, but they didn't actually do anything. You got a new weapon each time you levelled up, but in the end it was just a number that told you how much you'd played. "This time around we have a real levelling system where you have talent points and you get a power increase each time you level up. At the same time, it won't be the end-all. The skill is still the most important part of the game." To add depth to the itemisation system, Fatshark has added an extra variable aspect to weapons, in the form of properties. "In Vermintide we only had traits, but now we also have properties which are more like stats. Your weapon can change your stats, give you more health, make you better at blocking, or dodging, and stuff like that. Then we also have the traits as a top layer on that. That can completely change the way you use the weapon and give you different types of effects, stuff like that. That would be a big change." People that are drawn to a challenge, that are playing on the highest difficulties, I'm not sure that making it easier is the right reward for them. But at the very highest levels of the game, you won't necessarily be unlocking items that greatly boost your killing ability. Instead the greatest rewards will look shiny so you can show off your achievements. The idea is that high level gear represents skill rather than an ability to grind. If you see someone in a really nice hat, they will have had to earn that through competence rather than RNG. Anders puts it this way: "I think that really, really hard challenges, they are better off with something cosmetic like decorations for your team, or UI, or a fancy hat, or a nice skin, a way to show that you've completed it without making you super powerful. Of course if you manage to complete the challenge you probably are pretty powerful." "That's also a huge part of the top-tier loot, the cosmetic stuff. People that are drawn to a challenge, that are playing on the highest difficulties, I'm not sure that making it easier is the right reward for them. It's not necessarily the reward that they actually want. If we make the really challenging tasks easier if you grind, then it's not challenging anymore." Vermintide faces some dilemmas. It's a co-op game, so you don't want level disparity to break up friends, and you don't want powerful loot to remove the need for skillful co-operation. Fatshark's idea is to create a loot system that only carries you so far. Loot can change the way you play, and make you more powerful, but only to an extent. "We still want to have what we did in Vermintide, where the power level of your weapons shouldn't really matter that much," says Magnuson. "It does matter, but it's not the end-all of the game. You will never be able to grind yourself into completing the hardest difficulty settings. That will still definitely be 100 percent skill based." "We are really happy that we have parts of the game that are really insanely hard—I can't finish them, still—but that our community enjoys. They really like pushing themselves against insanely hard stuff. They've even created mods that pushes it even further. "We came up with this April Fools joke that was a death wish. It was just a joke, we changed everything to storm vermin, and there were rat ogres all over the place. And they took that joke and made it into a mod that a lot of the community are actually playing. We were like 'that is insane' but they can actually finish it, and even do solo runs. We were like 'okay, we need to provide sufficient challenge to these guys because they really enjoy it.' We really haven't removed that. We just made a loot system that gives you a much smoother, nicer experience while you're progressing through the game." Having played a few hours of the game, it was impossible to tell how these changes will shake out in the full game. Removing power level from the dice roll of loot drops seems like an obviously sensible move, but a lot will depend on the depth of the talents and levelling systems that take that weight. We'll dig into talents and the five classes next week.